268 pages | 80 B/W Illus. Simulating blood cells for biomedical applications is a challenging goal. Whether you want to investigate blood flow behavior on the cell scale, or use a blood cell model for fast computational prototyping in microfluidics, Computational Blood Cell Mechanics will help you get started, and show you the path forward. The text presents a step-by-step approach to cell model building that can be adopted when developing and validating models for biomedical applications, such as filtering and sorting cells, or examining flow and deformations of individual cells under various conditions. It starts with basic building-blocks that, together, model the red blood cell membrane according to its physical properties, before moving on to discuss several issues that may pose problems along the way, and finally leads to suggestions on how to set up computational experiments. 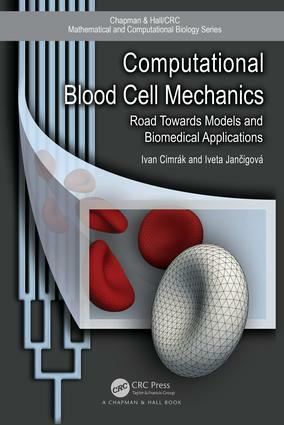 The book "Computational Blood Cell Mechanics" presents a comprehensive study on the modeling of blood cells, their mechanics and their behavior under the flow. I like the way the mathematical model of cell mechanics is presented with illustrative examples that accompany mathematical formulations. That will help the students, that are new to this area, in understanding the presented concepts. One of the most exciting parts of this book is the usable code that allows the reader to see the model in action by following the examples. Numerous illustrations allow easily to check whether the simulations run by the reader will return the expected results. The authors also provide several practical hints for mathematical modeling and for running the simulations effectively. In particular, the chapter on checking the model against "bioreality" is very valuable for students new to mathematical modeling. It contains step-by-step instructions of how to deal with building the model and make all the necessary checks to gain confidence in model validity and accuracy. This will help not only when the problems related to blood cell mechanics are considered, but for modeling of biological problems at large. I think that this is a great textbook for somebody starting in blood flow modeling and a very good reference book for experienced modelers. Ivan Cimrák is an associate professor at University of Žilina, Slovakia and the Head of the Cell-in-Fluid Research Group. Iveta Jancigová is a research assistant at University of Žilina, Slovakia and member of the Cell-in-Fluid Research Group. Both authors are contributors to the open-source project ESPResSo.